My favourite makeup combination recently has been a subtle pink lip and shimmery eye makeup. Perhaps this is because I want spring to hurry up as it's been so cold but the main reason why I love this is that it is so easy to apply and the results are always great. I find that with a smoky eye there is a higher chance that something could go wrong - especially with my application skills - but with this look you can just sweep the shadow all over your eyelid and, voila, you instantly look like you have put in more effort into your makeup than you actually have. I find that pink lips always compliment shimmery eyes as well. The two lipsticks that I tend to reach for to achieve this makeup look are the: YSL lipstick in number 8 and the Urban Decay lipstick in Sheer Obsessed. They are both quite sheer lipsticks so you can build the colour up or leave it less pigmented on your lips. The YSL one is slightly lighter than the Urban Decay meaning that I go for whichever one I fancy on the day. 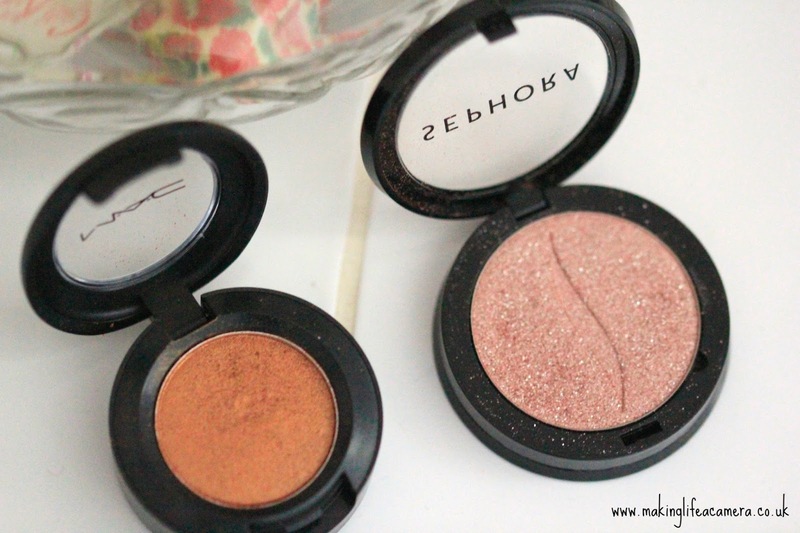 Moving onto eyeshadows, I usually wear the: Mac eyeshadow in Amber Lights or the Sephora own brand in Girl Talk. As you may be able to tell, the Sephora one is more shimmery than the Mac and has a more of a pink tinge - however, both are gorgeous shades. I will be most likely wearing this makeup look a lot this year. What are your favourite combinations at the moment? Really nice blog post. They look gorgeous too, the Sephora looks so pretty. They are so gorgeous! Aw, thank you - I definitely will be doing more!